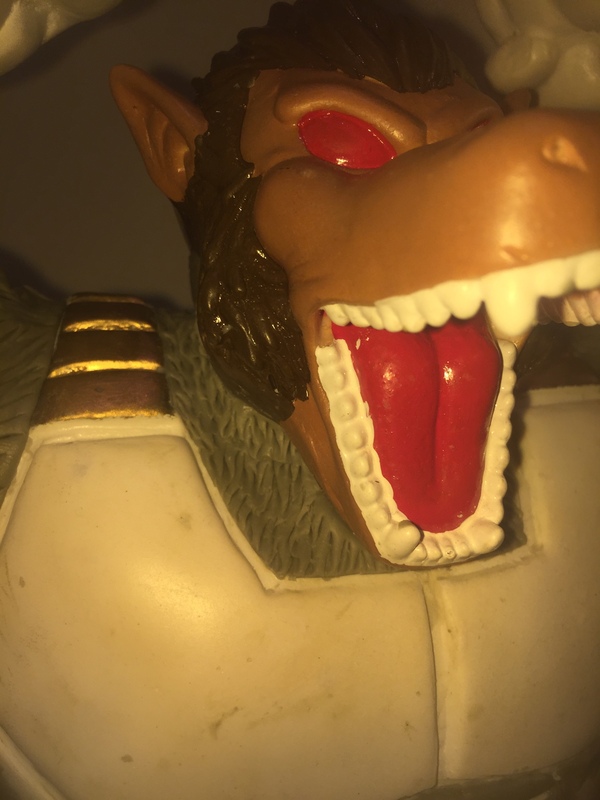 Hey guys this is my first custom so bare with me, this will probably take a while. 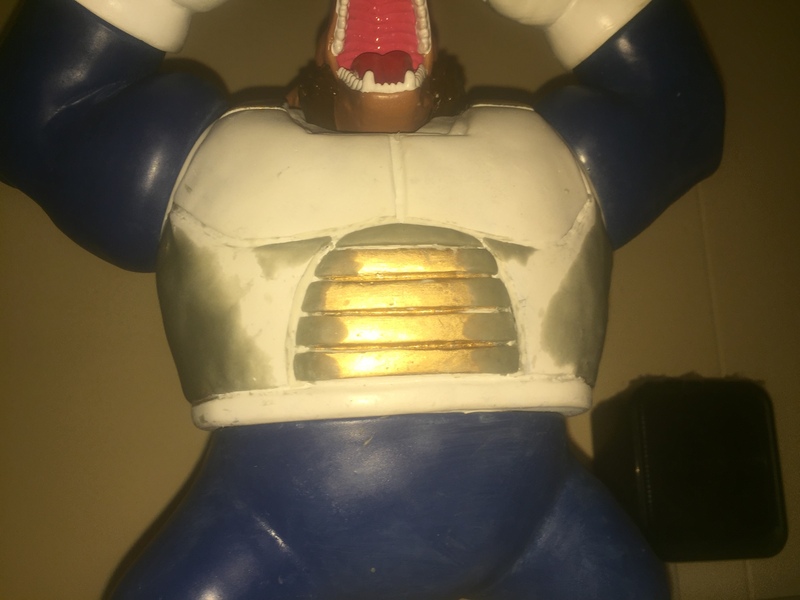 This shoulder pad-less vegeta bootleg inspired me to turn it into a bardock. 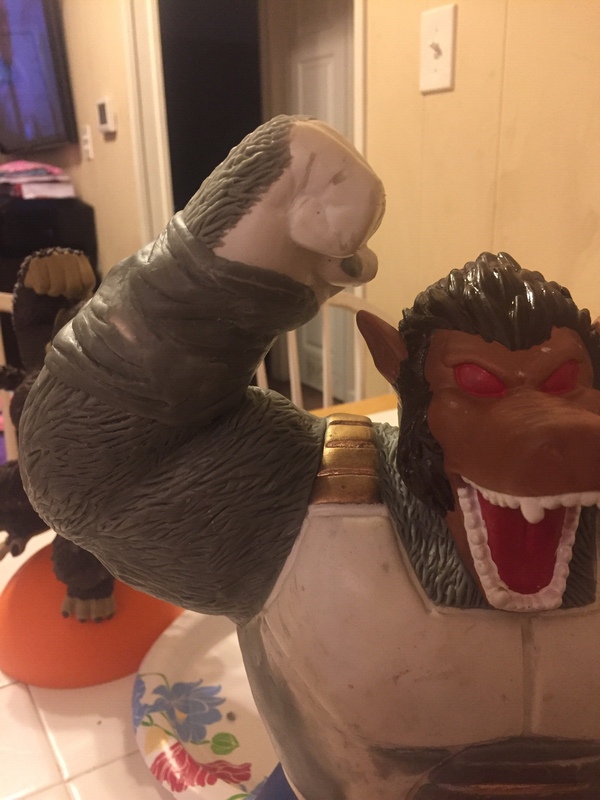 I had thoughts of getting the regular Kuji oozaru and using the arms from that but I don't wanna waste 100 bucks on arms- so I ordered some aves apoxy sculpt a sculpting tool set and an exacto set. 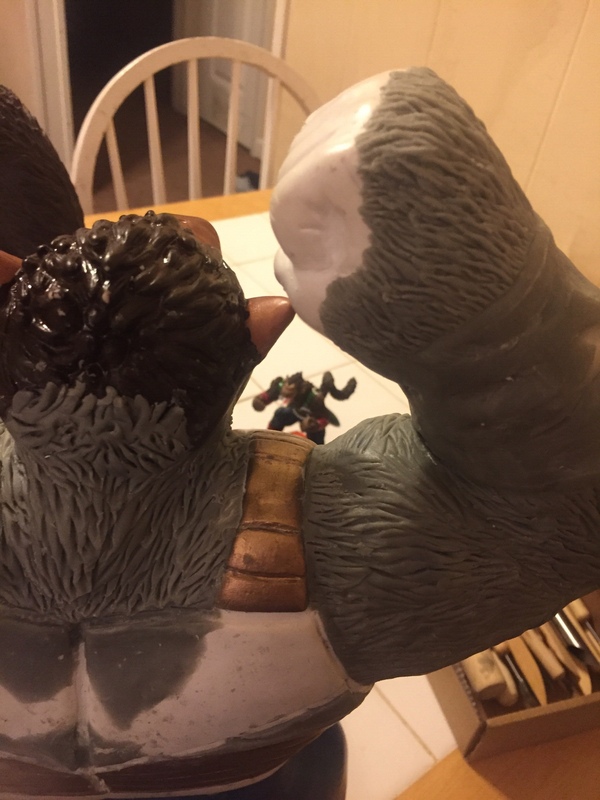 I have to sculpt fur on the arms. Fill in the neck area and add fur there. 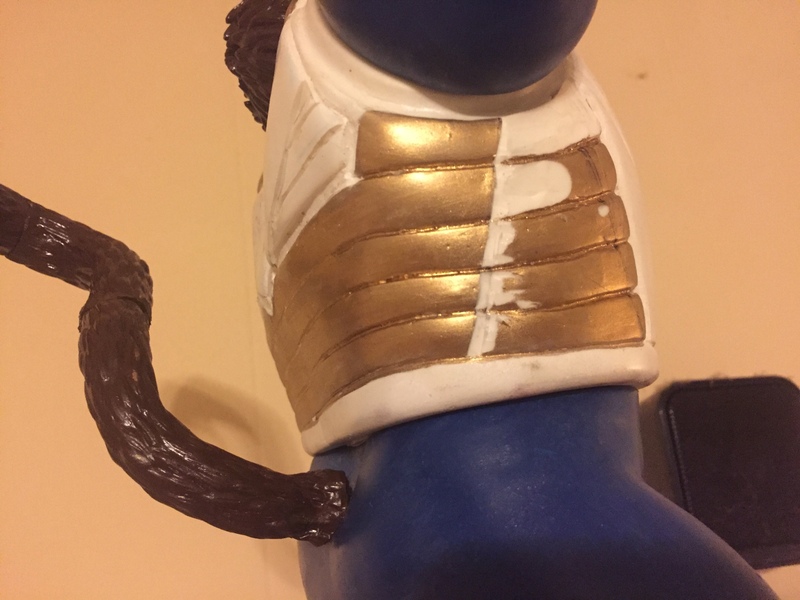 sculpt the arm and leg bands, and ideally modify the armor a bit but we will see where it goes. I got it yesterday and I started with what I could do today since the epoxy isn't here yet. 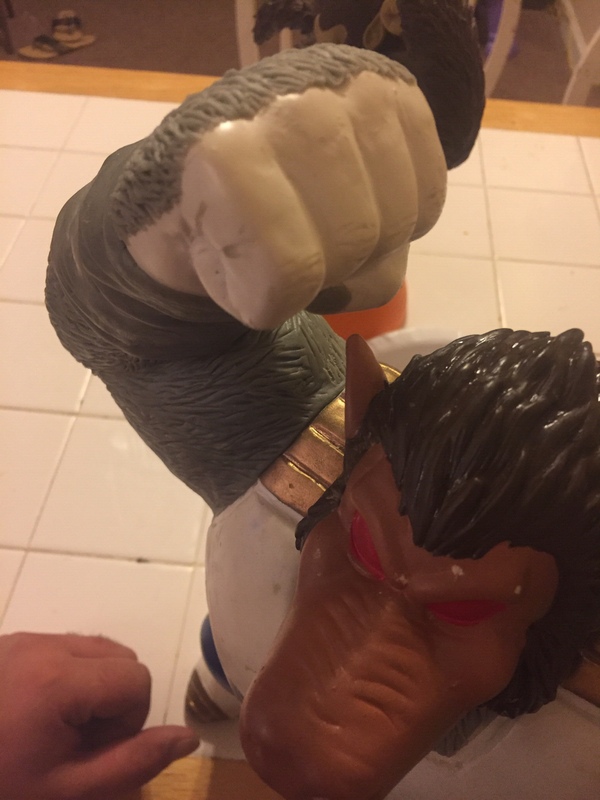 bardock doesn't have gloves So I sculpted all of the finger details, I have to add epoxy to form the nails once that gets in. This will be a long process but I'm gonna have fun with it and I hope it comes out well. Stay tuned. So I carved the armor changes today, obviously I still need to fill stuff in, so as soon as my epoxy gets here I will get started on that! But I'm pretty happy so far! I think there should be leg details sculpting if you are referring to the red cloth like thing around his ankle 'cause you won't have demolished buildings like in the pics to cover them up when you pose this figure in your collection. 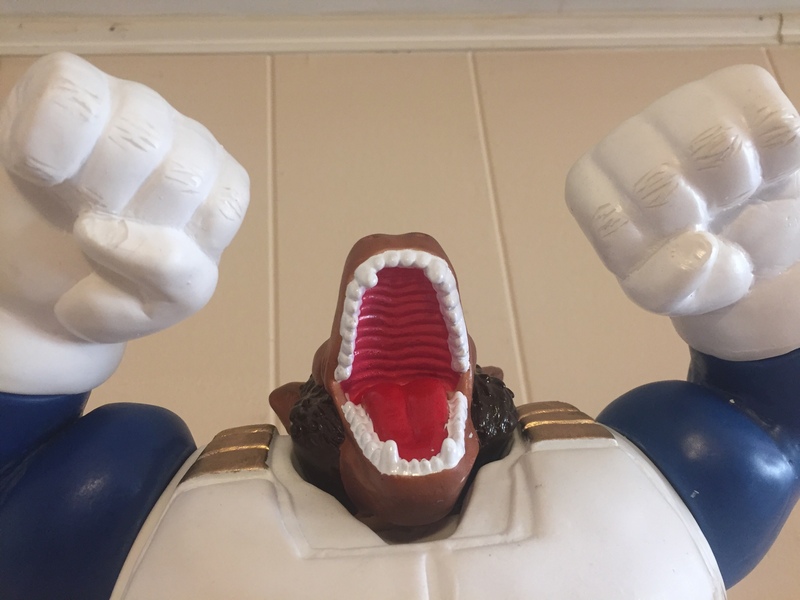 Is this the Ichiban Kuji Oozaru? I think he's referring to the skirt armor things, which Bardock has, but that isn't present in any shots from the actual special. For my money, I would say add them, but only if you feel up to it. 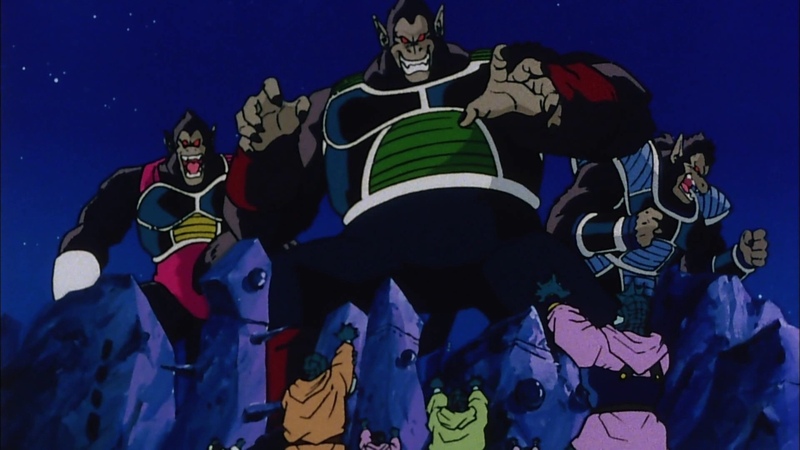 They are not present during the great ape scene, but Bardock does have them in the very next scene, which takes place after they've all powered down. 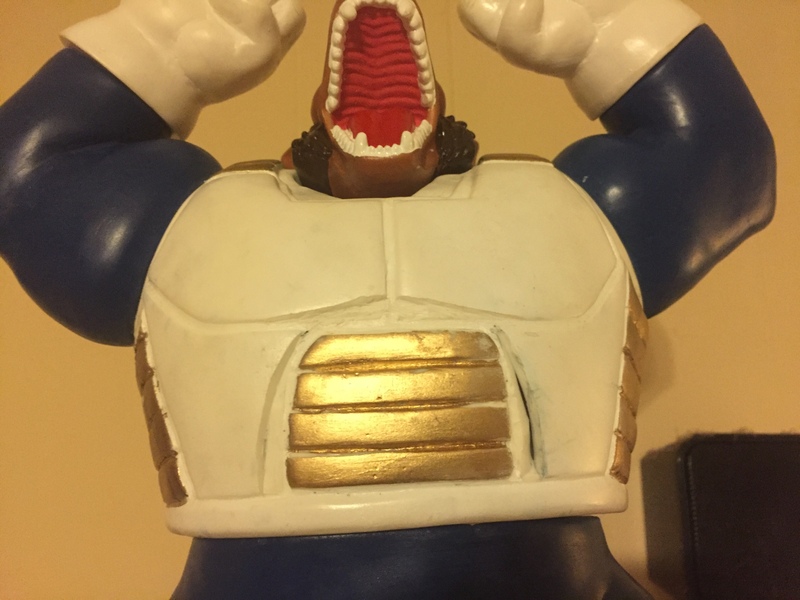 Additionally, they're present in almost all the video game versions of Bardock's Oozaru transformation, leading me to believe it was an animation oversight. 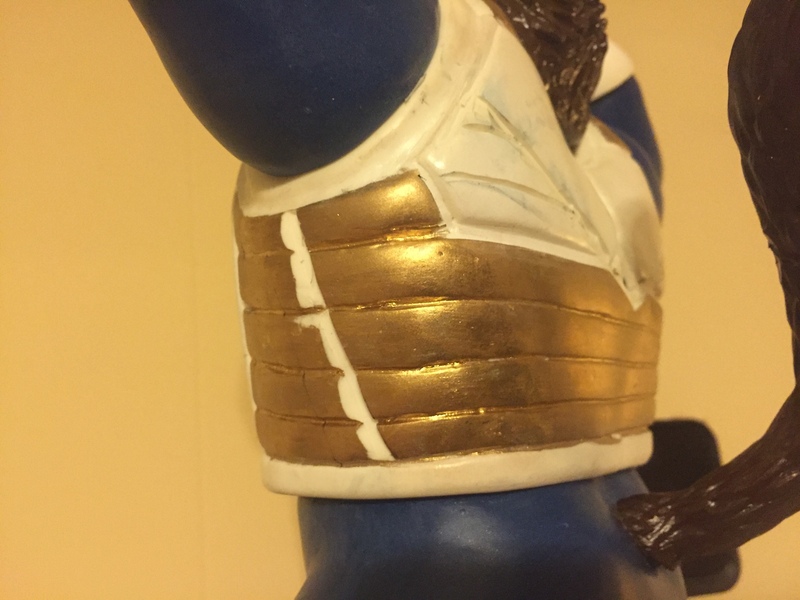 Oh ok. Well GP I think you should add those armor flaps to give it that close to Bardock look(before the demolition process) or if you purely want to stay true to the scene then leave it as it is, might as well call it battle damage. 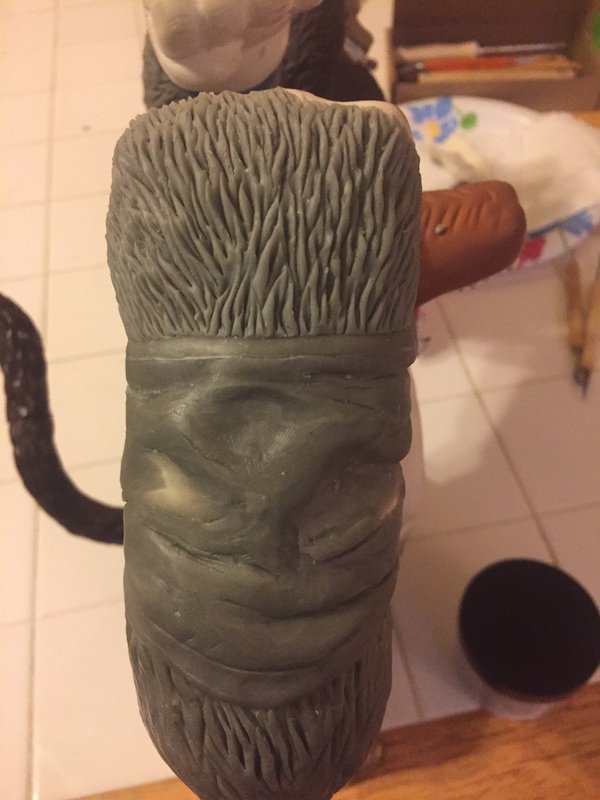 I'm gonna try my hand at sculpting them, if they don't come out good I will just leave them off. 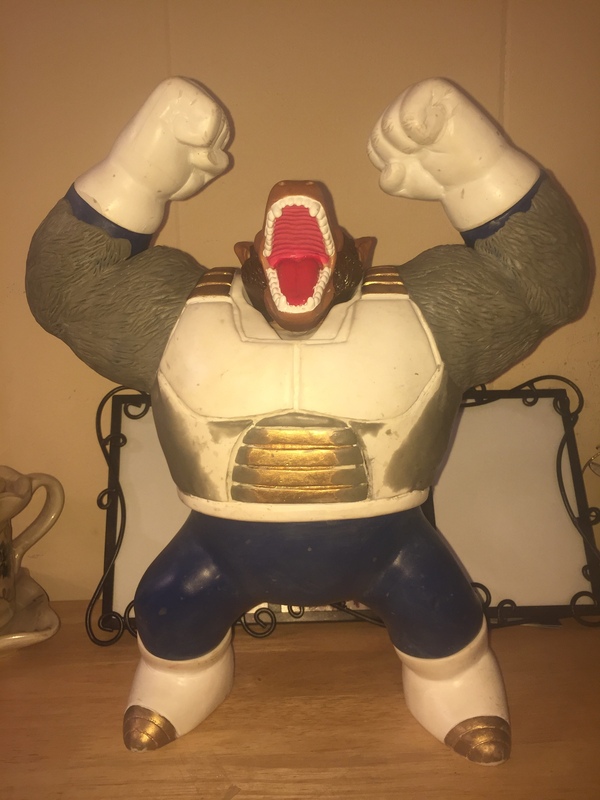 In the special there's an airborne scene during the oozaru attack and he does have them. But not in any of the close ups so definitely an animation oversight. We will see how it goes! 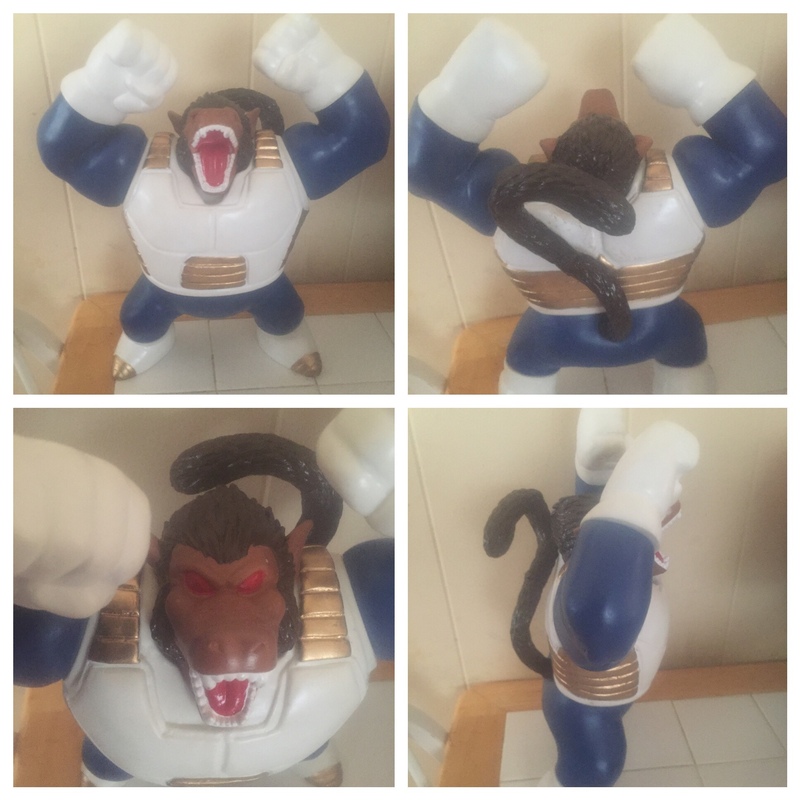 Alden this is a Mexican bootleg of the ichiban Kuji oozaru. 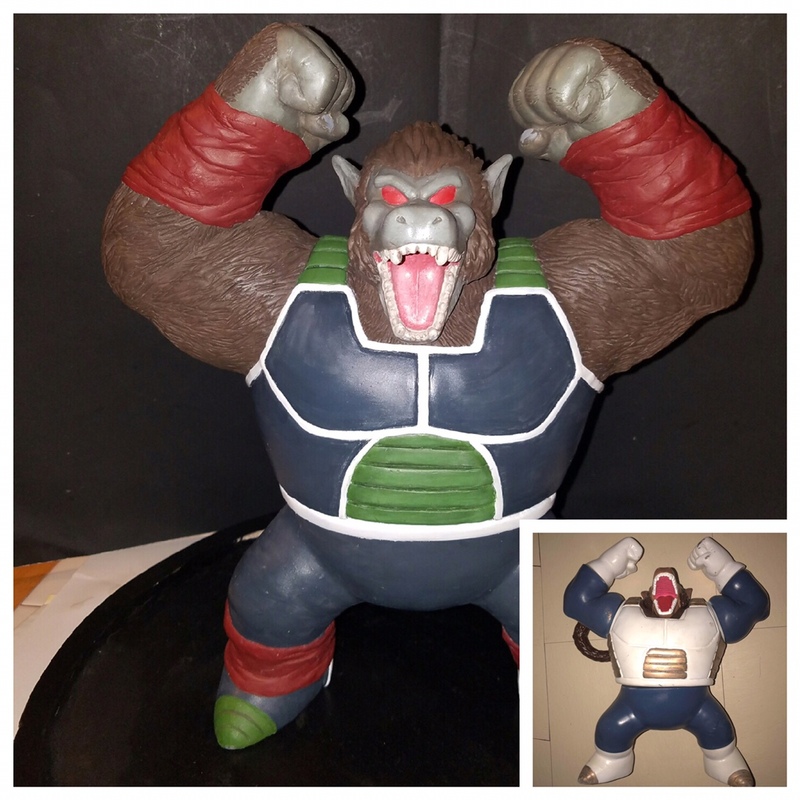 I can't wait to see the finished result, there aren't enough Oozaru customs imo. 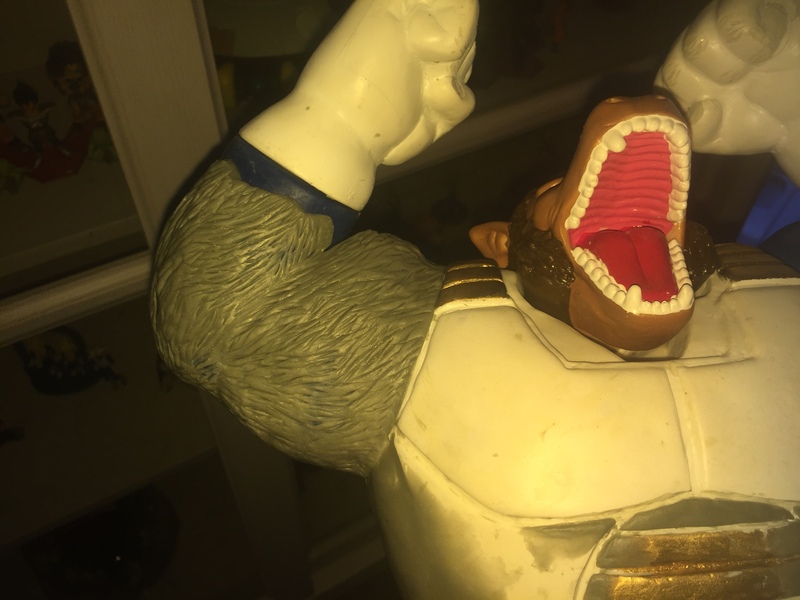 I still can't believe I never noticed the inconsistencies with Bardock's faulds/tassets in his great ape scene. I'm usually quick to notice things like that when watching movies or tv shows. Aves got here today, did this front bit when I got home from work. Planning to do the back tomorrow once the front cures. 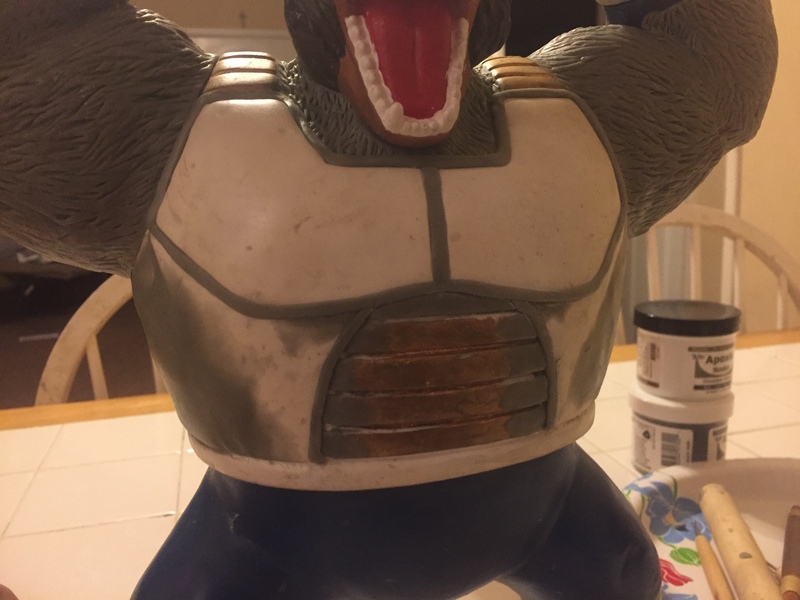 Guys, sculpting is hard as hell, I'm scared to do the fur lol. I'm gonna have to do lots of practicing before I attempt it on the figure. I'm looking forward to seeing how this turns out. 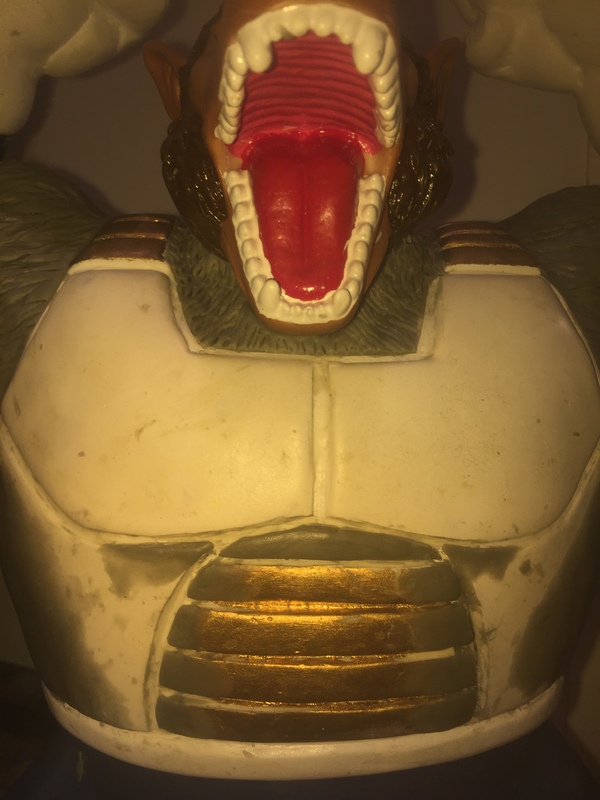 I'd try to give you some advice, but my sculpting skills are garbage. 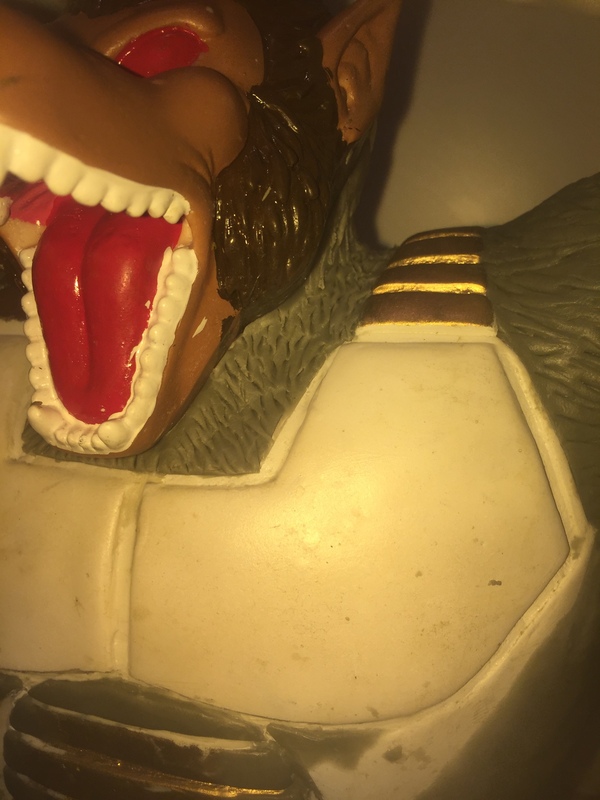 The fur looks good so far. Keep it up. Looking great so far, can't wait to see the final product. 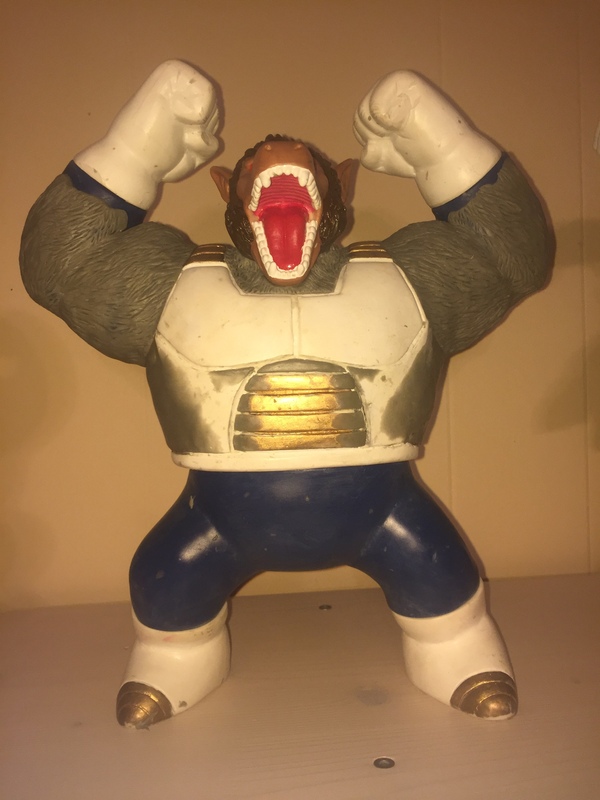 Why did you decide to sculpt the fur arms yourself, instead of getting a bootleg IchibanKuji Oozaru and combining both figures? I was honestly just gonna do that but i couldnt find a bootleg for cheap for a while. 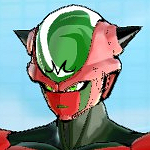 and i couldnt justify paying anything over $20 for arms. then i finally found one and ordered it. after 2 months it still never came. i gave up on it lol. then i was worried i wouldnt be able to do the fur correctly. but once i sat down and did it it was actually not too bad. 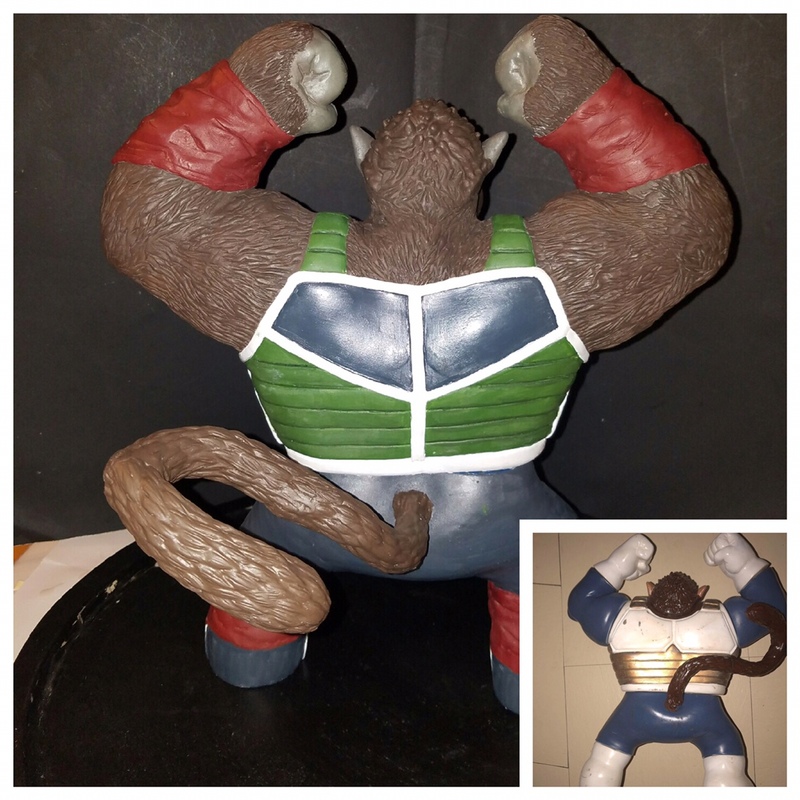 it did take about 2-3 hours per arm though between giving them a completely new shape compared to the original arms and adding the fur details. all in all, im happy with the results! i would have probably ended up with some ugly joints that i wouldve had to mend anyway plus its way more satisfying to say i did it myself! this thing is top heavy though i hope the leg flaps will give it weight to the bottom. 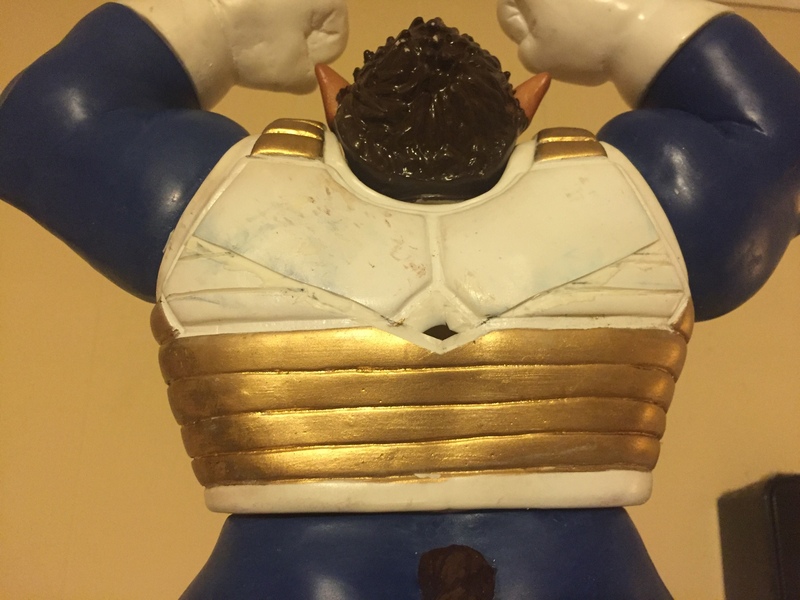 So I hated how the head was all recessed into the chest. I popped it out of the socket filled it in with tin foil and added some epoxy. 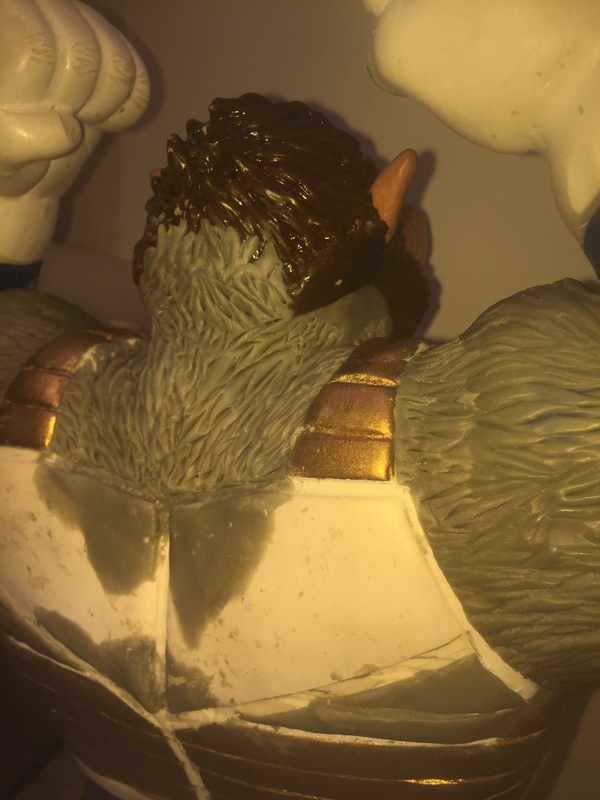 Lifted the head quite a bit and sculpted the neck fur. 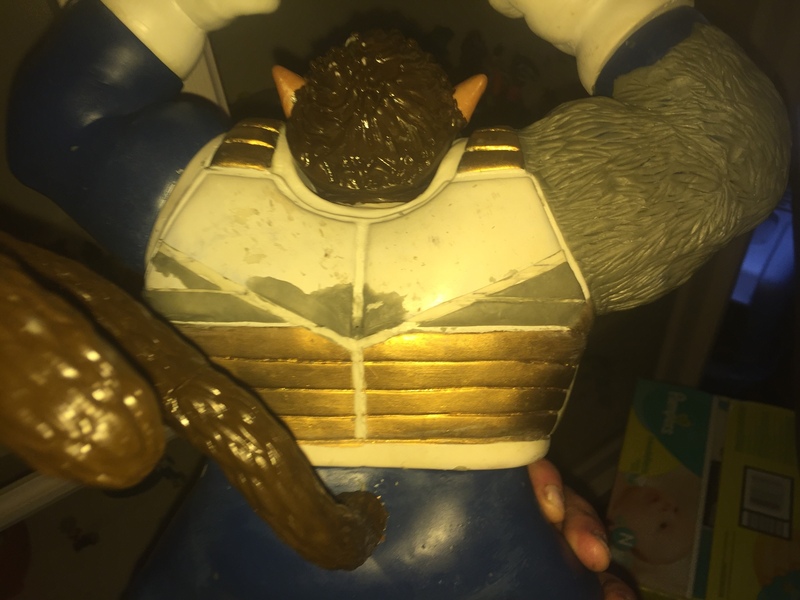 I also modified the armor on his back because it was down pretty low once I lifted the head. Let me know what you all think! I'm out of epoxy now, so there will be a little hiatus until I get some more. 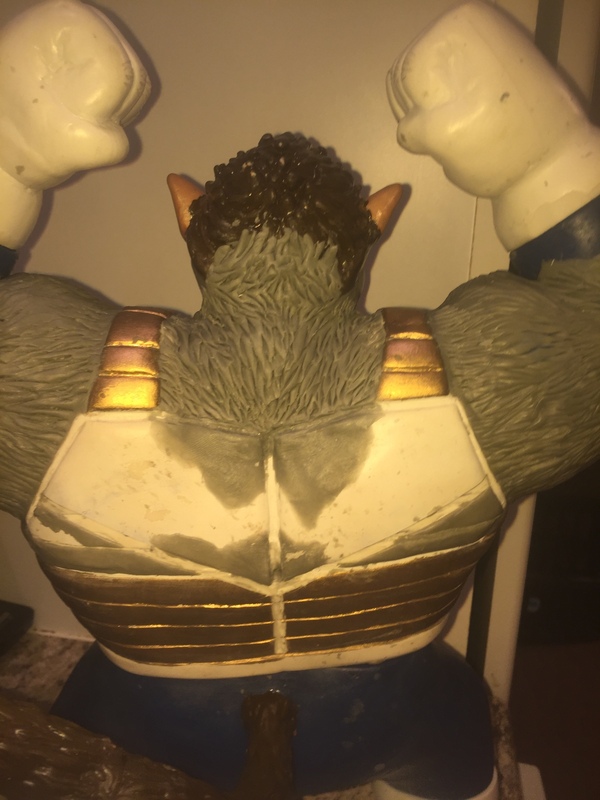 You can see an hd video of it on my Facebook group "legendary saiyans"